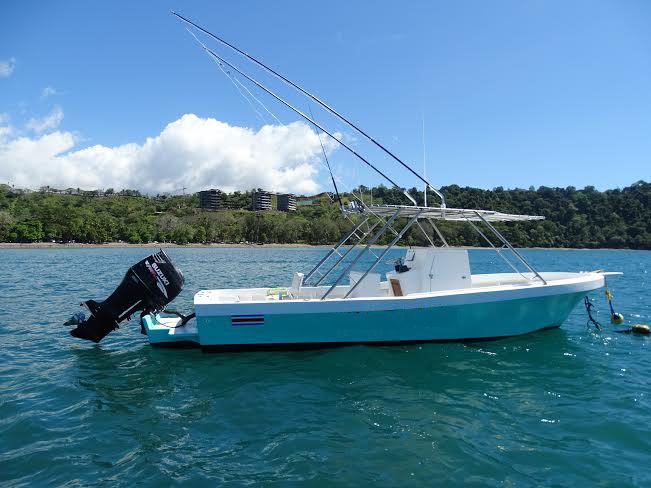 Here’s an update on several boats from Papagayo to Quepos ..
Brent took the family out on the 45ft , 4/6 sails .. 3 grouper and 5 small dorado. Did some bottom fishing and caught some grouper , jacks and snappers . Chin 2 , 31ft center console also did some bottom fishing and ended up 6 grouper , 4 snapper and 3 jacks ..
Don’t forget to check our lists of boats on the right hand side of our webpage , check the area that you will be staying . 25 Knots cruising, 38 top speed, Furuno 25 kw Radar, Salon with 40′ Sony Satellite Tv/dvd, full size refrigerator, convection oven. 3 staterooms, 2 queen beds and 1 bunkroom with twin beds with 3 full bathrooms, 6 A/C units, Fully enclosed air conditioned bridge. This entry was posted on Friday, July 3rd, 2015 at 3:06 am and is filed under Uncategorized. You can follow any responses to this entry through the RSS 2.0 feed. You can leave a response, or trackback from your own site.